Loving Transformation Tuesday and today I welcome the courageous and determined Scott who took the plunge and started to look after himself even though he wanted to do it for his kids as well, it all started with him. You know when something just clicks, you just do it. 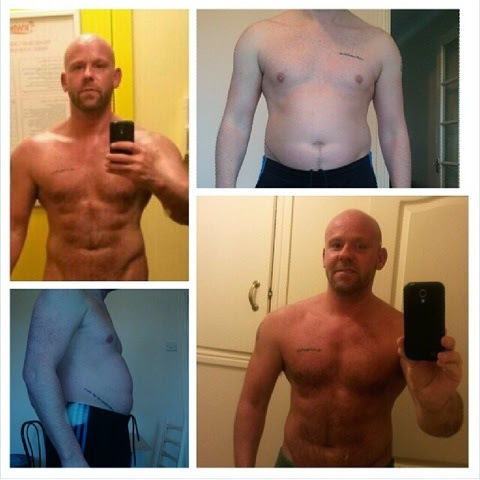 That's what happened to Scott and below he shares with us his new fit and healthy lifestyle. Until next week, stay healthy! I am 36 years old and 12 months into my 2 yr goal and I have reduced body fat and gained muscle without excessive excersise and strict dieting......constant moderation has been key for me. Take aways and fast food and also healthy meals. Since then I have started to count the calories and calculate my daily intakes. Don't play sports but enjoy watching the athletics. I now have a passion for cooking and it gives me the biggest smile when people say wow that tastes amazing! My ex partner calling me fat but mainly when I used to sit and watch my kids at the park even when they asked me to join in....now I have energy to match theirs. To maintain my determination to achieve and believe. Constant moderation worked for me....80% in the kitchen and 20% in the gym.....take note of your daily calorie intake and don't be afraid to spoil yourself with the occasional take away or fast food this will keep your sanity.